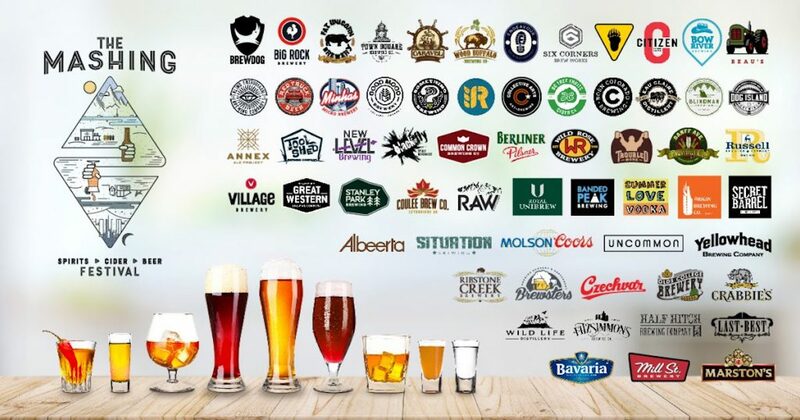 We know and love Alberta Beer Festivals (ABF) for their annual beer festivals including the Calgary International Beerfest, Edmonton Craft Beer Festival, Banff Craft Beer Festival and the Jasper Beer & Barley Summit. But what if we told you that ABF is putting on a festival that does not only revolve around beer, but cider and spirits too! The Mashing is a sampling event in Calgary and Edmonton. The MASHING (the common process used in brewing, distilling, and cider making) brings together the best distilleries, breweries, restaurants, artists and community in a unique space for a sampling event unlike any other in the world! At the MASHING, you’ll be able to immerse yourself in many of the things ABF believes in – the concepts of grains to glass and farm to table, all things local, art, culture, community, and a strong charitable component – all while sampling from incredible distilleries, breweries, cideries and restaurants. With DJs, a live music stage, art installations, photography walls and more – you’ll be transported to a whole new world just by stepping out in your own community. Live deep at the Mashing! Sorry kids, The MASHING is an 18+ event. Don’t forget your government issued photo ID! CLICK HERE to get your tickets! Use Promo Code MASH25 to get 25% off your tickets. I’m a beer geek! What does a Beer Geek VIP ticket get me? Great question! We’re glad you asked! Beer Geek VIPs get tons of awesome perks! (You don’t have to be a beer geek to enjoy these sweet perks. You can be a spirits or a cider geek too!) VIPs get their own separate entrance, their own private VIP Lounge area, private VIP washrooms and an exclusive gift card! Also at the Cask Stage, included with your VIP ticket you will receive three samples from casks specifically made for The Mashing! The MASHING Spirits, Cider, & Beer Festival has something for everyone (that is over the age of 18, of course). Not only can you sample your new favourite drink, you can also discover your new favourite song at the BassBuss Music Stage. Sip on a Brown Ale from Something Brewing while listening to David Bradford, a Calgarian, country-folk artist. Refresh with a cider from BC Tree Fruits Cider Company while enjoying the talents from Le Cirque de la Nuit. Or, get crazy with a cocktail from Secret Barrel Distillery while fist pumping to the beats of DJ Rusty Meeks. Thanks to Alberta Beer Festivals for bringing Germany’s Oktoberfest to Edmonton! BeerGuysYYC officially announces Calgary’s 2nd Annual YYC Beer Week to take place June 4 –10, 2018. Mobility Quotient, Creator Of Justbeer, Is Proud To Announce Their Partnership With Beerguysyyc, Creator Of Yycbeerweek For The Second Year. The Government is giving Canadian beer a huge makeover! JustBeer has entered into contract with the Brewers Guild of Alaska to work with and promote the BGA and the 27 brewery members registered under the association.